Gifts for husband and best friend. Buying gifts for the men in your life can be a very daunting task. However, if the loved one you have in mind is a member of the military, Military Online Shopping can make things a lot easier on both your time and your budget. Our unique shopping website will help you give a gift that an honorary member of the military deserves. The first thing one thinks of when considering gifts for a man isn’t usually jewelry. Nonetheless, this site has jewelry that can bring encouragement and pride to any military man. We sell an abundance of stunning military rings. These rings can be customized to say and represent almost anything. The laser vue design is etched inside the stone, ensuring a crisp image. 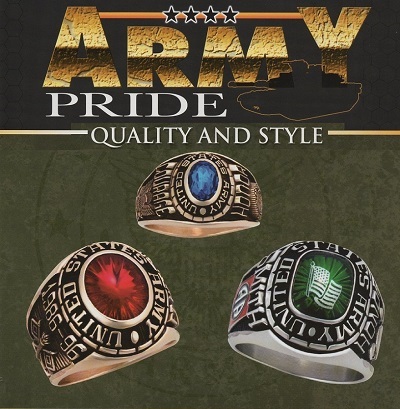 We even take it a step further by offering rings for the navy, air force, army and marines specifically. There’s no doubt your loved one’s eyes will light up when he lays his eyes on such a true-to-heart gift. Along with rings, we also offer clothing. Hats, jackets and t-shirts are just a few examples of the many types of clothing that can be purchased. As with the rings, our one-of-a-kind jackets can be customized to add a personal touch to your gift. We even have humorous t-shirts for sale. Perhaps the man you are buying for is interested in his ancestry. We have something for that as well. Military Online Shopping’s selection coat of arms will enable anyone to proudly show where they came from. When it comes to how that ancestry is displayed, the site offers a wide array of options. We feature embroidered coat of arms, family crest rings, family crest plaques, family shields, and family banners. Each of these items may even include a free family name history scroll. Our products for members of the armed forces goes one step further by including bracelets and watches. The currently most popular bracelet is one which has links that can individually be engraved upon. Military Online Shopping’s selection of watches is also impressive, however. We even offer a watch that proudly displays the United States Army branch. These are only a few of the possibilities Military Online Shopping has to offer in regards to buying gifts for husband or men in your life. We make the decision on what to buy easy with our many options. Whether you are looking for a gift geared toward the army, air force, navy, marine or military in general, we have everything covered.